In the coming weeks, MOJO Marketplace will be launching an entirely new marketplace and branding. As MOJO continues to help millions of small business owners, entrepreneurs, designers and developers do more online, they aim to continually improve their site function and overall user experience. The new marketplace will ensure you have easy access to tools and products you need to build and launch your website. And that you’re able to tap web professionals when needed and receive insight to grow and evolve your online presence. MOJO Marketplace currently has some of the leading themes across the board. For new or small businesses, finding the right theme is crucial for site optimization and conversion. 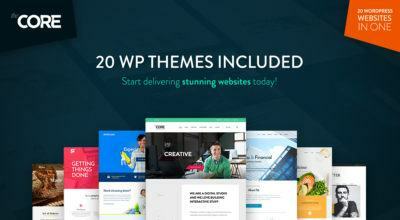 That’s why we’re focusing on MOJO’s top WordPress themes for businesses. 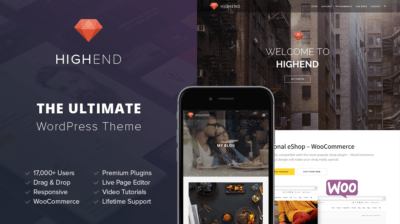 Rightfully named, HighEnd is the ultimate WordPress theme with unprecedented user reviews and drag & drop capabilities. 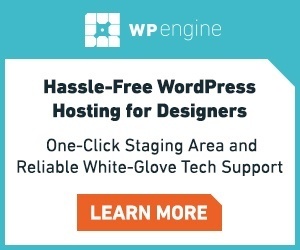 It offers off-the-shelf WooCommerce and other premium plugins, including video tutorials, lifetime support, and a live page editor. Whether your business is a blog or a dental office, Creativo offers the ease of configuring site demos by the click of a button. With automatic lifetime updates, you can rest assure that your site will always be up-to-date. 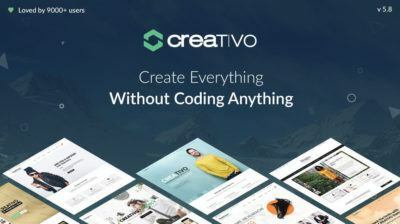 Creativo also looks amazing on any device: retina and mobile devices make no exception. Aegaeus not only fits any device to make sure your customers find your business on their mobile devices, it also comes equipped with multiple animations, unlimited layers, and custom landing pages. NIMVA combines many of the other aforementioned features and adds the ability to edit your pages using the front-end visual composer. This allows you to actually see in the live view mode how your pages look. 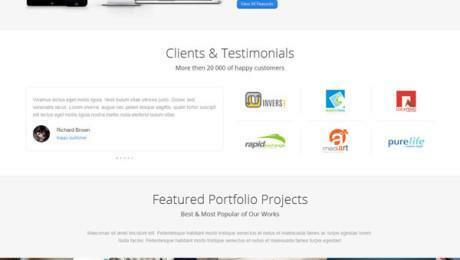 Includes 20 predefined home pages, contact pages, blog pages, shop pages, and more. 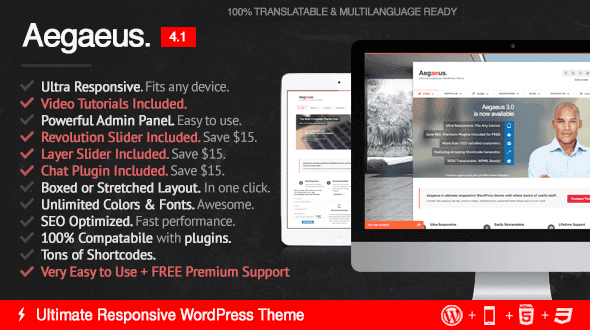 The Core is a massive multipurpose WordPress themes that comes with 20 different WordPress demo websites inside of it (stylish and purposefully built demos for specific industries). 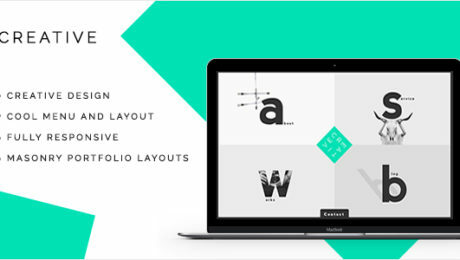 Choose boxed or full-screen layouts, unlimited background colors, any accent color, any font color, and advanced short codes. 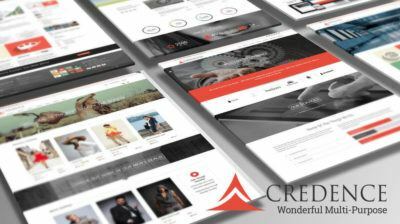 Credence is built on boostrap 3’s excellent responsive framework. 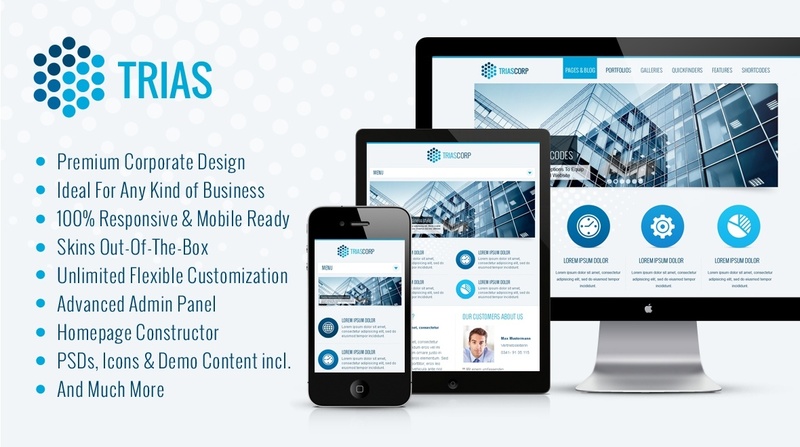 Trias provides you with almost everything your business website could need: company profiles, project/product showcases, flexible impressive slideshows & galleries, news, testimonials, awesome quick finders with modern flat icons to highlight your activity areas. 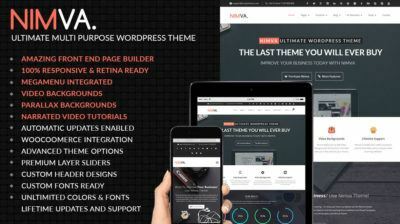 The theme uses HTML5 and CSS3 to create advanced styles using the latest technologies. Proper heading tags and coding standards are used to ensure outstanding search engine optimization. 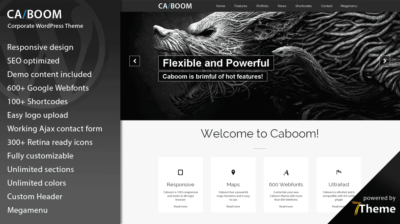 Caboom was made to be easy to customize to match your branding from within the WordPress admin area. When running a startup, the last thing you want to worry about is your website being out-of-date or lacking the support it requires to maintain it. 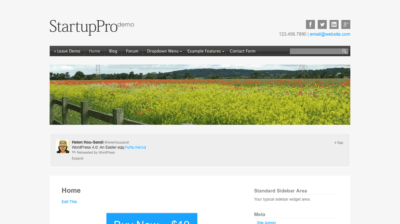 StartupPro offers free upgrades for life, a responsive design, SEO friendly, and offers custom social icons, and so much more. 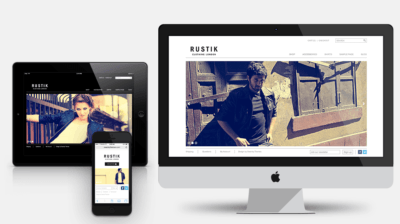 Rustik is a beautiful minimalist WooCommerce theme that makes your product the center of attention. But don’t be fooled by the beautiful exterior, behind it sits a brand-new options panel loaded with 160+ options that let you customize every detail of your site’s look.